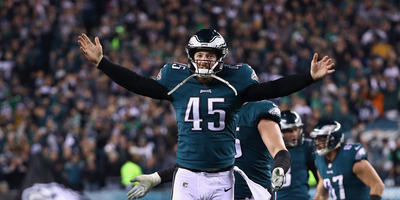 Eagles long snapper Rick Lovato recently revealed that the team kept the play, along with the rest of their game plan, in extreme secrecy, even going as far as running a fake walkthrough the day before the Super Bowl, for fear that the Patriots were watching. There’s no evidence that the Patriots were spying on the Eagles, but many conspiratorial-minded Philadelphians were convinced that was the case after the teams ran extremely similar trick plays. The Philadelphia Eagles won their first Super Bowl in franchise history this past Sunday, defeating the New England Patriots 41-33 in an instant classic. Philadelphia prevailed with the help of a practically flawless game plan, and Eagles long snapper Rick Lovato recently revealed that he believes the team took extra precaution during their final preparations for the game to ensure it was kept secret. According to Pro Football Talk’s Mike Florio, while speaking with 620 WDAE in Tampa, Lovato claimed that the team ran what was essentially a fake walkthrough of their Super Bowl game plan for fear that the Patriots had eyes on them. Lovato also said that the Eagles were careful not to run the now-famous “Philly Special” while in Minnesota, in case any Patriots prying eyes caught wind of the trick play they were keeping in their pocket. While there’s no evidence that the Patriots made an attempt to spy on the Eagles ahead of their matchup, the SpyGate controversy of 2007 has caused many to distrust the Patriots. After the game, numerous callers into local Philadelphia radio shows argued that the Eagles beat the Patriots despite they’re spying, citing how the two teams ran nearly identical trick plays as evidence. Whether the extra precaution was necessary or not, the “Philly Special” ended up as the play of the game, and it came as a surprise to everyone – including the Patriots.